Bleacher Bums was put on in different cities across the United States. 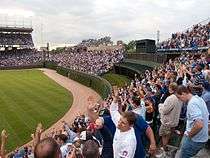 In 1981, longtime Cubs fan Jerry Pritikin, the Bleacher Preacher, was hired as a paid consultant for a production in San Francisco, instructing the cast there on Chicago fan vernacular, and proper fan behavior. Joe Mantegna and Dennis Franz starred in the original production, a performance of which was filmed for PBS broadcast in 1979, directed by Stuart Gordon. Other cast members over the years have included Dennis Farina, Gary Sandy, and George Wendt. A 2002 TV movie version for cable television was directed by Saul Rubinek and starred Brad Garrett, Wayne Knight, Matt Craven, Peter Riegert and Hal Sparks. Due to licensing issues with Major League Baseball, the name of the team was changed from the Chicago Cubs to the Chicago Bruins, and Wrigley Field was renamed. ↑ "Bleacher Bums (Part 1, 1984)". The Museum of Classic Chicago Television. 1984. Retrieved October 3, 2016. ↑ "Nothing to Cheer About". Chicago Reader. Retrieved 16 April 2015. Bleacher Bums book listing, ISBN 978-0-573-60576-5.